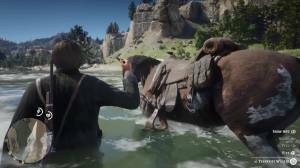 In the game’s dynamic environment, you’ll eventually get dirty by doing various actions. The accumulated dirt, grime, blood, etc will be visible on your clothes and body. To take a bath, you can visit a hotel and pay a miniscule amount to enjoy a soothing dip in a warm tub. 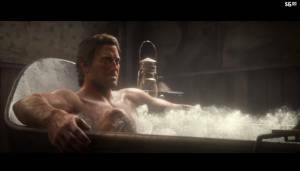 You can even avail the “deluxe bath” by paying extra, and a local maiden will scrub your body for you while having the option to have a small talk with her or not. This somehow includes laundry services in the background since your clothes will be perfectly cleaned as well upon leaving the bathroom. If you’re feeling cheap or don’t have access to the luxury of visiting a hotel or inn (because you’re probably on the run), you can just find a deep pond or stream and take a dip. Even if the body of water isn’t that deep, as long as a good portion of your body is submerged by crouching, you’ll still be cleaned by staying in the water for a few seconds. Soaking in the rain will also automatically clean both you and your horse.